Matt Colella didn’t have the energy to do much of anything. The chemotherapy and radiation had taken their toll, and the lightest physical activity exhausted the then-12-year-old. The once promising soccer goalie had to give up the sport, and simple tasks such as running 10 yards proved Herculean. There was one thing that wasn’t too taxing, though. He could kick a football. With soccer taken away from him throughout his treatment, Colella passed the time kicking footballs in his backyard. There were also the times he and his father, Rich, would go down to Oberlin College, where Rich played football in the 80s, and work on kicking. The pair may not have realized it then, but they were onto something. Matt could kick, and he could kick well. Four years later, he’s still kicking, though he’s ditched the backyard grass for the fields the St. Ignatius football team plays on each week. In his second season as the Wildcats varsity kicker, Colella has made a name for himself as one of the best kickers in the state, earning first-team All-Ohio honors last year. This year, his kicks have a little more meaning. His cancer diagnosis and subsequent treatment had a hand in leading him down the path he’s now on as a football player, and Colella is doing his part to help beat cancer through his kicking. Through an organization called Kick-It, he is taking pledges for each point he scores with the proceeds funding pediatric cancer research. To this point in the season, Colella has raised $3,880 through pledges and donations. His three field goals in last week’s win over St. Edward netted Colella $550 that will go to one of the several studies Kick-It supports across the country. Matt Colella was diagnosed with malignant sarcoma of the pectoral muscle in June of 2009. What followed was surgery to remove his left pectoral muscle and treatments that required three- or four-day stays in the hospital every three weeks. From June until December, Colella’s life was far from that of the typical 12-year-old. The treatments were taxing on his body, and forced Colella to miss the first half of his eighth grade year. Though according to his mother, Matt never let it affect him. Though he put on a stoic façade, inside Matt was understandably afraid. Kicking footballs, however trivial it may seem, helped. Matt began playing soccer at 3-years-old, and Laura said he was always quick to show off his big leg. As a goalie, Matt wouldn’t hesitate to try to kick the ball the full length of the field on goal kicks and punts, and sometimes he even scored. Soccer wasn’t an option during treatment, and even afterward his missing pectoral muscle ended his days as a goalie, but he still found a way to show off that big leg. Matt played soccer during his freshman year at St. Ignatius, though he was forced to play midfield and forward, and for the first time in his life, he played football, even if his mom had some reservations. He liked both, but his academic schedule required him to decide on one sport. He chose football. His abilities on the field, as well as his status as a National Merit Scholar and the 2240 he scored on his SAT test have caught the attention of a number of Ivy League programs, with Brown and Penn showing the most interest. Colella is also interested in Southern California, Arizona State and Michigan, among others. He’s not 100 percent sure if football is in his future — though he hopes it is — but he is sure he wants to study something in the science field. And if that leads him down a medical path, he hopes to find another way to get involved with pediatric cancer research. The need to give back is what got Colella involved with Kick-It in the first place. Kick-It was founded in 2009 by then-10-year-old Quinn Clarke, a Chagrin Falls native and cancer survivor who turned his love for kickball into a way to raise funds for pediatric cancer research. Since then, Kick-It has hosted hundreds of kickball tournaments across the country, and one in Australia, and has raised nearly $2 million, according to Cathy Welsch, Director of Kick-It. 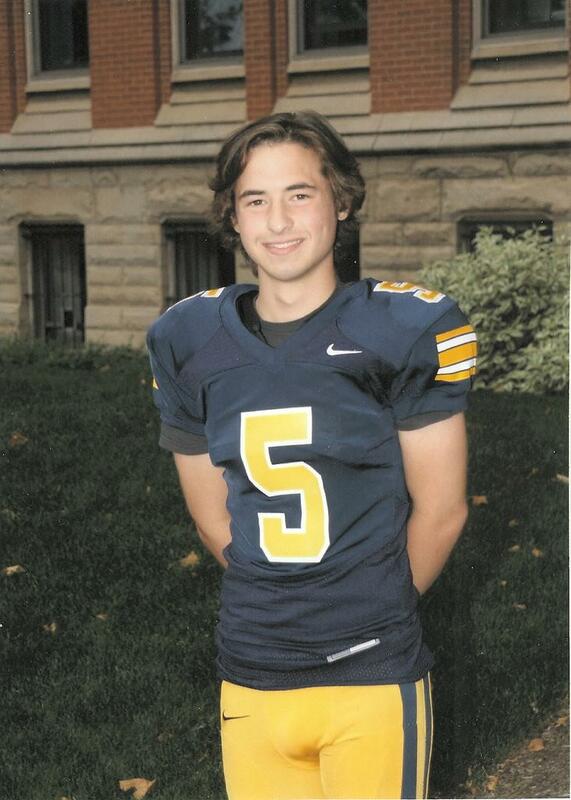 Colella has never met Clarke, but he became aware of Kick-It through the annual kickball tournament held at St. Ignatius in honor of Kevin Healey, a St. Ignatius alum who lost his battle with cancer in 2009 at age 20 while he was a student at the University of Notre Dame. Colella wanted to get involved, and found a different way to do it by having people pledge money for the amount of points he scores. Welsch hopes he’s the first of many to get involved through football. Colella hopes it catches on as well, and his work with Kick-It and life experiences with cancer have given him a new perspective when it comes to his performance on the field. Kicker can be one of the most pressure-packed positions in sports, and while some succumb to that pressure, Colella has realized there are more important things to worry about. Some things have been taken away from him. He has to tailor his workouts to what his body is able to do — heavy weight lifting is out of the question with the missing pectoral muscle — and he misses out on some of the teammate bonding that can come during weight training. Since going through treatment, Colella’s scans have been clear. He’s due for another scan in December and then hopefully his final scan a year from then. He knows there are others who are in a much worse position, and he keeps those people in mind when he’s put into a pressure situation. Pressure or not, the ball sails through the uprights most of the time, and while those points are valuable to the team, they’re even more valuable to people who aren’t on the field.